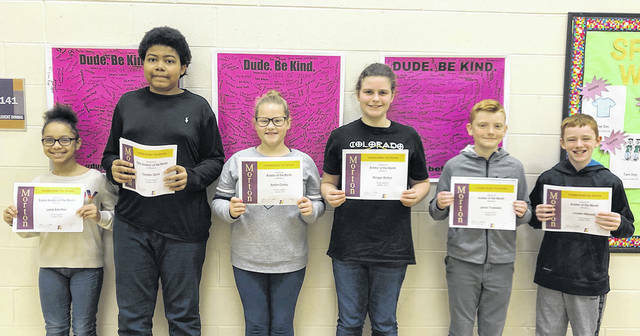 Congratulations to the sixth grade Morton Aviators of the Month pictured left to right Lexie Albritton, Cayden Davis, Ashlin Conley, Morgan Britton, Jacob Truesdale, and Louden Maxwell. Congratulations to the seventh grade Morton Aviators of the Month pictured left to right Toby Mears, Grace Louderback, Natalie Schoenherr, Kiersten McBride, AJ Turner, and John Graham, Jr.
Congratulations to the eighth grade Morton Aviators of the Month pictured left to right Patricia Nihizer, Maya Frank, Sydney Webster, Tyler Bradford, Cooper Decker, and Cayden Borchers. Toby Mears, Grace Louderback, Natalie Schoenherr, Kiersten McBride, AJ Turner, and John Graham, Jr.